This week also went really well, even if I spent a lot less time on my crafters. I was also less diligent restocking materials at the tail end of the week as we will see, but BoEs are still carrying me really well! Another massive week this time around! 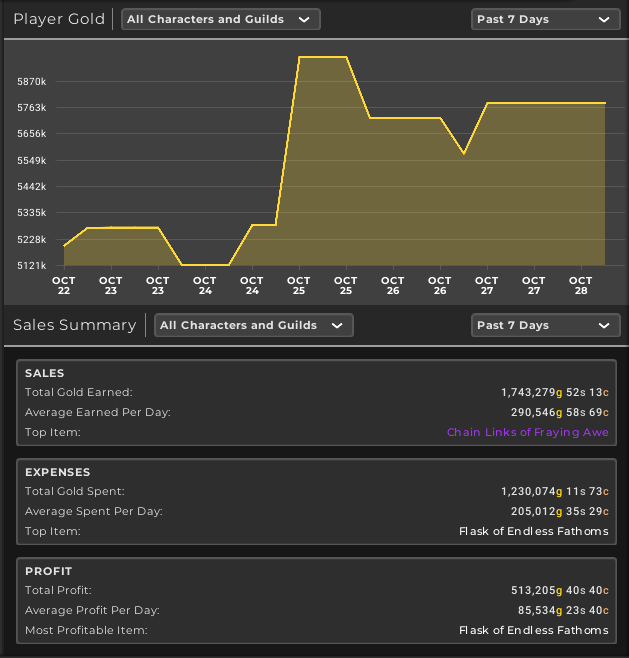 I managed more than 2 million gold in sales for the second week in a row, which is amazing! 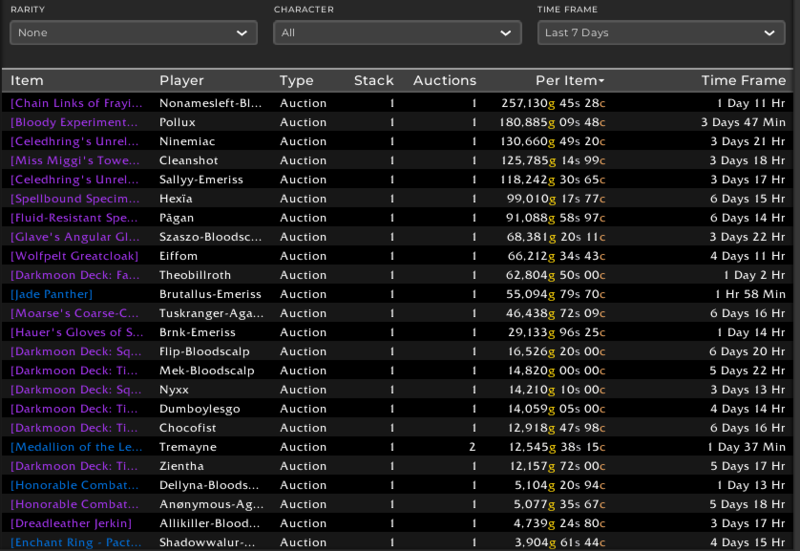 I also increased both the value of all my posted auctions as well as the amount of Liquid gold I have on me. This indicates that I am on the right path. The total value of my auctions and my liquid is now above 15 million, so I just need to sell of some stuff and I will be at Gold Cap. Overall I am very happy with how the last weeks have gone, the major factor has of course been hitting a decent stride with BoEs to finally generate some large sales! This week had a VERY high volume of BoEs. I sold a total of 11 of them, and even if none of them were above 300k, it’s still a very nice overall volume. Some other highlights include, darkmoon decks, a jade panther for 55k (!) and finally selling two of my Medallions of the Legion! BoEs are my main focus at the moment, as the market is just as good as it has been in other expansions! I’m still working in my “regular” markets. I restocked some enchants and gems today, and material flipping is a constant trickle of sales. Augment rune and flask flipping is sadly still on the experimental stage even if sales have been slightly better lately. The summary below shows that flasks and augment runes are inconsistent, but looking OK. My volume is much lower this week as I spent much less time searching for deals this week sadly. 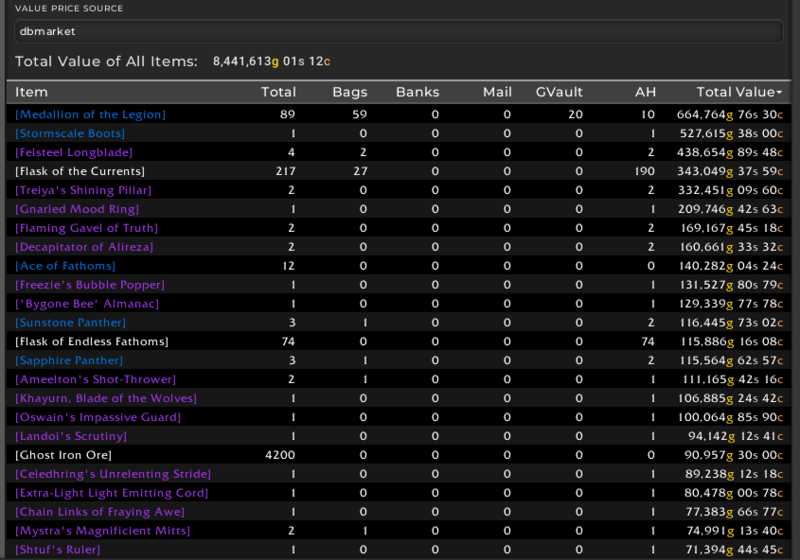 My inventory is skewing more and more towards BoEs, even if the value tracking still isn’t working too well. I’ve almost run out of darkmoon decks though, so a card crafting session is definitely on the books. I also still need to get some more panthers, particularly ruby and jade, which are selling fastest at the moment for me.